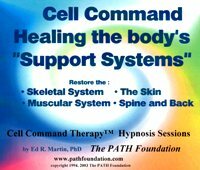 Cell Command Therapy Hypnosis Sessions on CD are actual hypnosis sessions on a single CD with actual Cell Commands in the hypnotic suggestions. 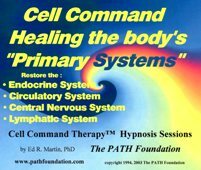 They are recorded both verbally and subliminally so they may be listened to and enjoyed as personal private hypnosis sessions or as peaceful music Cell Command Therapy Hypnosis Sessions on CD work through the mind body connection. Health results depend on the persons ability to achieve the proper level of hypnosis. We make no health claims or guarantees since results may vary. Also for health treatment contact your health care professional.